Summarize the benefits of moving from Salesforce for Outlook to the Outlook integration and Lightning Sync. Discover whether you’re eligible to migrate. Plan for the migration process. If you’ve been on the Salesforce Platform for a while, it’s likely you’ve used our tried-and-true, locally installed Microsoft® Outlook® integration product, Salesforce for Outlook. It has helped sales reps stay productive for a long time. But we’ve made important advancements to deliver the next-generation, cloud-based Outlook integration products, Outlook integration and Lightning Sync. That’s where we’re heavily investing our developmental efforts now. And we don’t want you left behind. If you and your sales team are new to integrating Outlook and Salesforce, take a break! There’s no need for you to work through the steps in this unit. But we welcome you to read along and take the quiz. We know that you want that badge! Why Move to the Outlook Integration and Lightning Sync? Well, the good news is that the Outlook integration and Lightning Sync are ready to go wherever your reps go. That means the integration is available to your reps on locally installed versions of Outlook and on Outlook on the web. Sales reps always have access to the latest and greatest features. And the newest features appear without you or your reps having to install updates. That’s a huge deal. And your friends in IT become even bigger fans of yours for choosing products with few maintenance requirements. Before you invest any time migrating your sales reps, review system requirements in the Resources section. How Does Moving to the Latest Solution Benefit Admins? Simplifies the administrative process, because you don’t maintain versions. Whenever we add new features, those updates happen on the Salesforce side of business, along with the other Salesforce updates you get three times a year. Takes the stress out of deployment, because we’ve made the deployment process for you easier than ever. You get the option to let your reps deploy the Outlook integration add-in themselves. Or you can deploy the add-in for them, which is a great way to score even more points with them. Puts you in control of the sync process, because you can decide whether everything syncs or your sales reps choose the items that sync. At one time, Salesforce for Outlook included more features than the Outlook integration. But that’s no longer the case. The integration now includes a set of features even more rich and refined than Salesforce for Outlook. And you can add more features to make your reps even more productive by upgrading to the Outlook integration with Inbox. We talk about that in the last unit. We recommend that you develop a test plan using these steps. 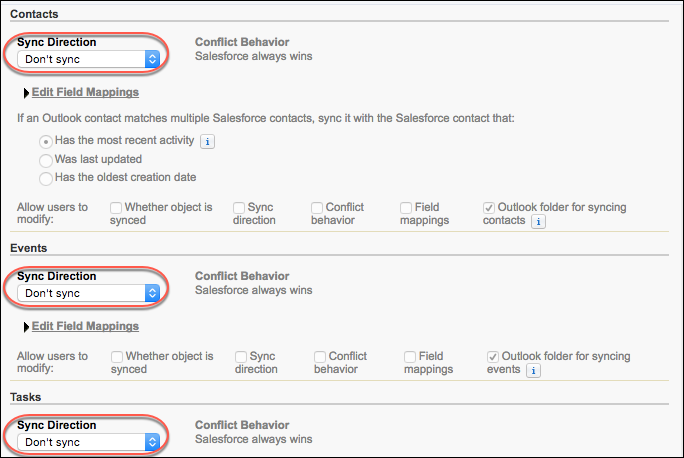 Identify the differences between Salesforce for Outlook and the Outlook integration. Review the integration and Lightning Sync system requirements in the Resources section. Start with a small test group. We recommend using a sandbox environment. Include yourself in that group, so you can quickly get in front of any issues that arise. Establish a timeline to deactivate Salesforce for Outlook. Communicate the deactivation timeline to your sales reps. And tell them that during the actual move, their items won’t sync, and that the Salesforce Side Panel in Outlook won’t be accessible. Disable features in your Outlook configurations. We show you how a little later. Coordinate with your IT pro to uninstall Salesforce for Outlook from your reps’ computers. Or if your reps have administrative permissions for their computers, point your reps to the procedure for uninstalling Salesforce for Outlook in the Resources section. If you tested using a sandbox, keep test data out of production by disabling Lightning Sync configurations for the sandbox. To learn more, read about considerations for companies with multiple Salesforce organizations in the Resources section. In this abbreviated procedure, you disable Salesforce for Outlook features for the side panel and sync functions, as opposed to uninstalling Salesforce for Outlook altogether. 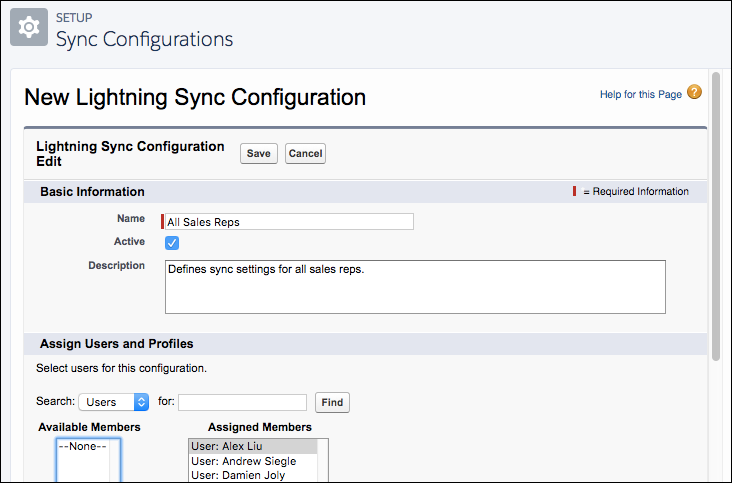 Then you turn on Lightning Sync, and deploy the integration to users. The next unit includes more setup details. Click , and select Setup. Enter Outlook in the Quick Find box, and then select Outlook Configurations. Click Edit next to an Outlook configuration. Scroll to Data Settings, and then deselect Side Panel and Add Email. For contacts, events, and tasks, set the sync direction to Don’t sync. Then click Save. Enter Outlook in the Quick Find box, and then select Outlook Integration and Sync. Turn on the Outlook integration. Turn on Lightning Sync and expand the settings. Define the connection method for your Exchange server. In Sync Settings and Check Status, click New Configuration. Then, give it a name, select Active, and assign members. For contacts and events, select sync directions. Then, click Save. Now you’ve got an idea of what’s involved in the migration process. But keep in mind that the next unit gives you access to more details for setting up the Outlook integration and Lightning Sync. Use these resources to learn more about the Outlook integration and Lightning Sync.